Texas Bucket List: Watch a football game at Kyle Field. We've twice watched the A&M Consolidated High School and Bryan High School football teams battle it out at Kyle Field (the number of fans who attend this cross-county rivalry game drastically exceeds the capacity of both high school football stadiums, so the teams play their annual match-up at Kyle Field), home of the TAMU Aggies and widely recognized as the one of most incredible places in the country to cheer on a college football team. And while I "counted" attending these games toward finishing my Texas bucket list, I still hoped to someday see the Aggies play a game in their home stadium. We made that happen by attending this spring's TAMU Maroon & White Game. For a number of reasons, this scrimmage, rather than a regular season home game, provided our family of four with the perfect opportunity to watch the Aggies play on Kyle Field. Tickets cost $5 each for Tom and me, and the kids were free. We spent $10 total to get into the scrimmage, but would likely have to spend $200+ to get into a regular game. We have more fun when we spend less, primarily because we know we won't feel guilty if one of the kids melts down and we have to leave early. The scrimmage, while very well-attended (45,000+ fans and a new attendance record), wasn't as crazy as a regular game. We didn't have to arrive as early as we would for a regular game and it didn't take us as long to exit the stadium once the game came to an end, both factors that positively influenced our kids' moods and attitudes. The weather in early April, when compared to the weather in August, September, and October, is BEAUTIFUL. We rode our bikes to and from the stadium (no parking hassles to deal with! ), and comfortably enjoyed the sun and light breeze while sitting in the stands. The Aggies were going to win no matter what. Those boys of mine are too competitive for their own good, and they don't always react well when their teams lose, so I enjoyed the game more knowing I wouldn't have to talk anyone down off a ledge after the final whistle blew. Johnny Manziel. He didn't play the entire game, but we still saw him in action AND up close and personal. We totally lucked out and happened to be walking by at the exact moment the team left the field - Will high-fived everyone, Tom gawked, I jumped up on a rock wall to snap a few pictures, and we all ignored Hallie, who we felt didn't show the appropriate level of post-game Aggie/Johnny enthusiasm. why we weren't willing to spend money to take her to a regular season game. I had trouble keeping track of defensive scoring. can you shed some light on this for me? Tradition? Prayer? Sign of respect? Johnny throws yet another completion. halftime, but I enjoyed the demonstration given by the Ross Volunteer Company. were completed with unbelievable precision. first round of the upcoming NFL draft) received their Aggie Rings at halftime. bigger in person than he looks on television. Johnny walked off the field last, and was fully surrounded by coaches and security. but I could have reached out and touched him. I was thrilled to have had the opportunity to watch the Aggies - especially Johnny - play on Kyle Field and to check that experience off my Texas bucket list. 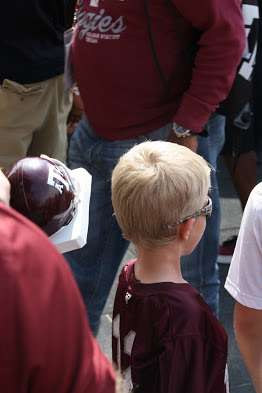 And if this year's Maroon and White Game is any indication, the 2013 football season is going to be a great one!